통화 센터들(call centers)과 결합된 하나 이상의 에이전트 터미널들에 대한 IVR 능력들을 분배하는 분산형 대화식 음성 처리 시스템(distributed interactive voice processing system)이 개시되었다. The call centers (call centers) a distributed interactive voice processing system (distributed interactive voice processing system) for distributing the IVR capabilities of the one or more agents in combination with a terminal are disclosed. 하나 이상의 에이전트 터미널들은 가상 및 자동화 에이전트의 기능들을 지원하기 위한 부가적인 IVR 능력들뿐만 아니라, 라이브 에이전트(live agent)의 종래의 기능들을 지원한다. At least one agent terminal must support the function of the conventional, as well as additional IVR capabilities for supporting functions of the virtual and automated agent, the live agent (live agent). 통화 관리 시스템(call management system)은 분산형 대화식 음성 처리 시스템 내에 라이브 및 자동 IVR 에이전트들의 이용가능 상태를 모니터하고, 적절한 에이전트에 대한 전화 통화들과 다른 형태의 통신들을 분배함에 의해 분산 IVR 리소스(distributed IVR resource)들을 관리한다. Call Management System (call management system) is distributed IVR resources By monitoring the live and Availability The use of automated IVR agent in a distributed interactive voice processing system, and the distribution of other types of communication with the phone call to the appropriate agent (distributed manages the IVR resource). 자동 IVR 에이전트들의 이용가능 상태(available status)는 에이전트 터미널 상에 추정된 이용가능 CPU 싸이클들에 기초한다. Availability of automated IVR agent status (available status) is based on the available CPU cycles estimated on the agent terminal. 수신된 통화는 선택된 IVR 채널과 연결된 에이전트 터미널 상에 확장을 위해 발송된다. The incoming call is sent to the extension on the agent terminal associated with the selected IVR channels. 선택된 IVR 채널과 연결된 VXML 프로세스는 집중 VoiceXML 애플리케이션 서버로부터 적절한 애플리케이션 소프트웨어를 얻고 IVR 스크립트로부터 통화자에게 적절한 프롬프트들을 수행하고 통화자로부터 DTMF 또는 음성 인식된 입력들을 모으기 위해 VXML 페이지(들)를 실행한다. VXML process associated with the selected IVR channels to obtain the appropriate application software from concentrate VoiceXML application server performs the appropriate prompt to the caller from the IVR script and run (s) VXML page to collect a DTMF or speech recognition input from the caller. 분산형 설계는 개선된 IVR 이용도를 제공하기 위해 분산 리소스들을 이용하는 동안 집중 애플리케이션 관리를 허용한다. Distributed design allows for intensive applications while using the distributed resource management in order to provide an improved utilization IVR. 본 발명은 일반적으로 보이스 메시지들, 전자 메일 메시지들, 팩시밀리들, 텍스트 메시지들, 및 인터넷 서비스 요청들을 포함한, 다양한 통신의 형태들이 운용을 위해 다수의 서비스 에이전트들 사이에 분배되는, 통화 센터들(call centers) 또는 다른 통화 처리 시스템들에 관한 것이다. The present invention relates generally to voice messages, e-mail messages, fax, text messages, and including Internet service request, call centers of various forms of communication are to be distributed among multiple service agents to operate ( relate to call centers) or other call processing systems. 통화 센터들은 잘 알려진 자동 통화 분산 기술(automatic call distribution technique)들을 사용하여, "에이전트들(agents)" 로서 여기에 참조되는, 고객 서비스 대표자들(customer service representatives)이 이용가능한 전화 통화들 및 다른 형태의 통신들을 분배한다. Call centers are well-known automatic call distribution technology using (automatic call distribution technique), "agents (agents)" here refer, customer service representatives (customer service representatives) are available telephone call that the a and other forms the allocation of the communication. 착신 통화(incoming call)들을 처리하는데 이용가능한 에이전트들보다 더 많은 착신 통화들이 존재하는, 통화 과잉 상태(call surplus condition)일 때, 상기 통화 센터는 필요한 능력을 가진 에이전트들이 착신 통화를 처리하는 것이 가능하게 될 때까지 수신된 착신 통화들을 활성 상태(active state)로 유지하기 위해서 하나 이상의 통화 큐들(call queues)을 유지한다. When the incoming call (incoming call) process is used, that there are more incoming calls exist than agents available to call excess (call surplus condition) of the call center is capable of agents to handle the incoming call with the necessary capacity for the reception of incoming calls until it is to remain active (active state) maintains one or more call queues (call queues). 통화 센터들은 기록된 메시지들의 형태로 정보들을 통화자(caller)들에게 효과적으로 제공하고 기록된 질의들(queries)에 대한 키패드(keypad) 또는 음성 응답들을 사용하여 통화자들로부터 정보를 얻기 위해 자주 대화식 음성 응답(interactive voice response : IVR) 시스템들을 사용한다. Call centers are often interactive in order to obtain information from callers using the keypad (keypad) or negative response to the providing information in the form of a written message effectively to the caller (caller) and write queries (queries) the use of: (IVR interactive voice response) system, voice response. 상기 IVR 시스템들은 "자동화 에이전트들(automated agents)" 또는 "가상 에이전트들(virtual agents) " 로서 종종 불린다. The IVR systems are often referred to as "the automated agent (automated agents)" or "virtual agents (virtual agents)". Avaya Inc.사제의 CONVERSANT ® System for Interactive Voice Response와 같은 현행 통화 센터들은 집중 서버-기반 대화식 고객 서비스 솔루션들(centralized server-based interactive customer service solutions)로서 일반적으로 구현된다. The current call centers, such as CONVERSANT ® System for Interactive Voice Response of Avaya Inc. priests intensive server-based Interactive is typically implemented as the customer service solutions (centralized server-based interactive customer service solutions). 많은 IVR 시스템들은 IVR 스크립트들을 생성하기 위해 음성 확장성 마크업 언어(Voice eXtensible Markup Language: VoiceXML)을 사용한다. Many IVR systems are voice extensible markup language to create the IVR script: Use (Voice eXtensible Markup Language VoiceXML). 일반적으로, 미디어 서버(media server)는 통화를 수신하고, 전용의 로컬 및 원격 서버(remote server)로부터 적절한 VoiceXML 페이지를 얻고, 그 후 통화자를 위한 VoiceXML 페이지를 실행한다. In general, the media server (media server) obtains the appropriate VoiceXML page from a received call, and the local and remote server (remote server), dedicated, and then executes the VoiceXML page for those calls. 그런 IVR 리소스들의 집중화(centralization)는 이들 리소스들의 관리 및 유지를 더 효과적이고 또한 집중된 장애(fault) 모니터링 때문에 잠재적으로 더 확실하게 만든다. Such centralization of IVR resources (centralization) makes it potentially more reliable because these resources and a more effective management and maintenance of converged addition disabilities (fault) monitoring. 또한, 대부분의 IVR 시스템들에 의해 제공된 중복(redundancy)은 통화 센터의 효과적인 작동에 중요하고 발견된 장애에서 대체 장치(alternative device)로 계속하기 위해 IVR 테스크들(tasks)을 허용함에 의해 장애로부터 복구를 위한 능력들을 개선하는 고객 서비스 성능의 계속된 이용가능성을 확보하는 것을 돕는다. In addition, the recovery from a failure by as redundant (redundancy) provided by most of the IVR system allows the IVR tasks (tasks) in order to continue with the replacement device (alternative device) from the important to the effective operation of the call center and found fault to improve the capability for helping to ensure the continued availability of the customer service performance. 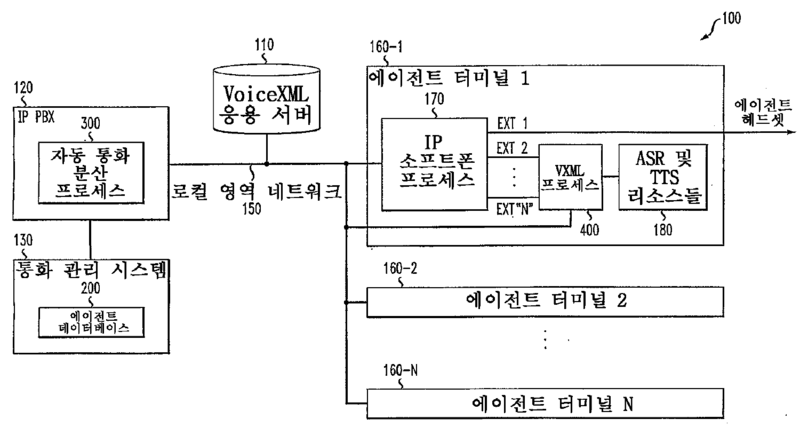 집중 구현(centralized implementation)은 변경과 업그레이드를 명령하는, 사적 통화 플로우들(proprietary call flows)과 스크립팅 언어(scripting language)를 포함하는, IVR 애플리케이션 프로세스들의 효과적인 유지를 또한 허용한다. Centralized implementation (centralized implementation) maintenance of an effective, IVR application process that includes the, the private call flow changes and upgrades to the command (proprietary call flows) and scripting language (scripting language) is also permitted. IVR 시스템들은 일반적으로 디지털 및 아날로그 음성 회로들, 복합 주파수 부호(dual tone multiple frequency:DTMF) 처리 시스템들, 음성 인식 시스템들 및 텍스트-음성 변환(text-to-speech) 처리 시스템들을 포함하는, 통화 센터에 의해 요구되는 다양한 서브시스템들(subsystems)과 인터페이스로 접속해야 한다. IVR systems are generally digital and analog voice circuits, multi-frequency code (dual tone multiple frequency: DTMF) processing systems, speech recognition systems and text-containing-to-speech (text-to-speech) processing system, a call It should be connected in a variety of subsystems (subsystems), and the interface required by the center. 그러므로, 다른 시스템들과 인터페이스로 접속하기 위해 IVR 시스템들에 의해 요구되는 전문화된 회로(specialized circuitry)는 그와 같은 집중된 설계들을 위한 부가적인 동기(additional motivation)를 제공한다. Therefore, a specialized required by the IVR system to connect to another system and an interface circuit (specialized circuitry) provides additional synchronization (additional motivation) for centralized design such. 통화 센터에서 에이전트들은 일반적으로 로컬 영역 네트워크(local area network: LAN)를 이용하여 서로 연결된 컴퓨터 터미널들을 이용한다. In the call center agent typically a local area network: using a (local area network LAN) uses a computer terminal connected to each other. 통화가 이용가능한 에이전트에 할당될 때, 통화자 또는 통화(또는 둘 모두)에 대한 정보는 에이전트에 대한 표시를 위해서, 통화로써 에이전트들의 터미널까지 자주 발송된다. When the call is assigned to an available agent, the information about the caller or call (or both) in order to display to the agent, it is often sent as a call to the terminal of the agent. 이와 같이, 에이전트는 최근의 통화-특성 정보(call-specific information)를 가진 효과적인 방법으로 통화를 처리하기 위해 더 잘 준비된다. Thus, the agent of the last call-is better prepared to handle the call in an effective way with the attribute information (call-specific information). 통화 센터에서 다양한 에이전트들 사이에 분산된 처리 리소스들이 일반적으로 에이전트들이 통화 처리 기능들을 수행하는 것처럼 활용되었다는 것이 발견되었다. That the processing resources distributed among the various agents in the call center agents have been generally utilized as performing call processing functions it has been found. 그러므로 통화 센터에서 에이전트 터미널들 사이에 분산형 IVR 기능들을 위한 방법 및 장치가 존재할 필요가 있다. Therefore, there is a method for distributed IVR function between the agent terminal in the call center, and must be present apparatus. 에이전트 터미널들로부터 분배 또는 집중 또는 전용 IVR 서버들로 대체하기 위해 분리된 프로세서 싸이클들을 사용하는 IVR 시스템을 생성하기 위한 방법 및 장치들이 더 필요하다. A method for generating an IVR system using the processor cycles to remove replaced with distributed or centralized or a dedicated IVR server from the agent terminal and the devices are required. 일반적으로, 분산형 대화식 음성 처리 시스템(distributed interactive voice processing system)은 통화 센터들과 결합된 하나 이상의 에이전트 터미널들에 대한 IVR 능력들을 분산하는 것으로 개시되었다. In general, the distributed interactive voice processing system (distributed interactive voice processing system) has been disclosed for dispersing the IVR capabilities of the one or more agent terminals coupled with the call center. 본 발명에 따라 에이전트 터미널은 가상 또는 자동화 에이전트의 기능들을 지지하기 위한 부가적인 IVR 기능들만큼, 라이브 에이전트의 종래의 기능들을 지지하는, 퍼스널 컴퓨터, 워크스테이션 또는 개인 휴대 정보 단말기(personal digital assistant)와 같은, 컴퓨터 시스템이다. According to the invention the agent terminal as long as the additional IVR capabilities for supporting functions of the virtual or automated agents, which supports the conventional function of a live agent personal computer, workstation, or personal digital assistants (personal digital assistant) and such as a computer system. 분산형 대화식 음성 처리 시스템은 본 발명에 따라 분산형 IVR 리소스들을 관리하는 통화 관리 시스템을 포함한다. Distributed interactive voice processing system comprises a call management system for managing a distributed IVR resources in accordance with the present invention. 일반적으로, 상기 통화 관리 시스템은 분산형 대화식 음성 처리 시스템에서 라이브 및 자동 IVR 에이전트들의 이용가능 상태(availability state)를 모니터링하고 적절한 에이전트들에 대한 전화 통화들과 다른 형태의 통신을 공급한다. In general, the call management system in the interactive voice processing system, the distributed monitoring and use of the live state (availability state) of the automatic IVR agent supplying different type of communication with the phone call to the appropriate agent. 자동 IVR 에이전트들의 이용가능 상태는 에이전트 터미널 상에서 추정된 이용가능 CPU 싸이클들에 기초한다. Availability status of the automated IVR agent based on the available CPU cycles estimated on the agent terminal. 통화가 분산형 대화식 음성 처리 시스템에 의해 수신될 때, 통화는 선택된 IVR 채널의 에이전트 터미널 상에 확장에 대한 잘 알려진 기술들을 사용하여 발송되고 원격 IVR 프로세스가 통화를 처리한다. When the call is received by the distributed interactive voice processing system, the call is sent using the well-known technique for the enhancement in the terminal agent of the selected IVR channel being processed is a remote process call IVR. 에이전트 터미널들은 VXML 프로세스(또는 IVR을 위한 HTML-기반 지원을 제공하는 다른 프로세스), 및 임의로, 자동 IVR 에이전트의 IVR 기능들을 지원하는 텍스트-음성 리소스들(text-to-speech resources) 및 자동 음성 인식(automatic speech recognition : ASR)의 설정을 포함한다. Agent terminals VXML process (or other process that provides support for HTML- based IVR), and optionally, automated IVR agent of text that support IVR functionality - voice resources (text-to-speech resources) and Automatic Speech Recognition It includes a set of: (automatic speech recognition ASR). 통화가 주어진 에이전트 터미널의 분산형 IVR 확장에 대해 분배될 때, 결합된 VXML 프로세스는 적절한 적용 페이지 및 IVR 스크립트를 중앙 VoiceVXML 애플리케이션 서버로부터 얻는다. When a call is distributed to the distributed IVR expansion of a given agent terminal, the combined VXML process to obtain a proper application IVR script pages and from the central VoiceVXML application server. 상기 VXML 프로세스는 IVR 스크립트로부터 통화자까지 적절한 프롬프트들을 수행하고 통화자로부터 DTMF 또는 음성 인식 입력들을 모으기 위해서 VXML 페이지를 실행한다. The VXML process performs the appropriate prompts from the IVR script to the party and run VXML page to raise the voice recognition or DTMF input from the caller. 주어진 통화가 끝날 때, VXML 프로세스는 통화를 끊거나 적절한 통화 센터 에이전트 또는 애플리케이션에 대해 통화를 전송하기 위한 IP PBX 스위치를 요청할 것이다. When the end of a given currency, VXML process will require the IP PBX switches for transferring calls to the appropriate call or hang up a call center agent or application. 이와 같이, 본 발명은 일상적인 사용 또는 집중 서버 시스템들이 완전하게 로딩되거나 오버로드(overload)될 때 최고 사용을 위해 IVR 채널들을 공급하기 위해 에이전트들의 터미널의 "사용되지 않는(idle)" 리소스들을 효과적으로 이용한다. Thus, effectively the present invention daily use or concentrated on the server machine are fully loaded or overload (overload) terminal of the agent to provide the IVR channel for best used when the "unused (idle)" Resources use. 분산형 디자인은 개선된 IVR 이용가능성을 제공하는 분산형 리소스들을 사용하는 동안 집중 적용 관리(centralized application management)를 허용한다. Distributed design is used for the distributed resources to provide an improved availability of IVR allows for centralized management apply (centralized application management). 본 발명의 특징들과 이점들 뿐만 아니라, 본 발명의 더 완벽한 이해는 다음의 상세한 설명 및 도면들을 참조하여 얻어질 것이다. As well as features and advantages of the present invention, a more complete understanding of the invention will be obtained by reference to the following detailed description and drawings. 도 1은 본 발명에 따라 분산형 대화식 음성 처리 시스템을 도시한 도시도. 1 is a block diagram showing a distributed interactive voice processing system in accordance with the invention shown. 도 2는 본 발명의 특징들과 결합한 에이전트 데이터베이스로부터의 샘플 기록을 도시하는 도면. Figure 2 is a diagram showing a sample recording from the agent database combined with the features of the present invention. 도 3은 본 발명의 특징들과 결합한 분산형 IVR 관리 프로세스의 예시적인 수행을 설명하는 흐름도. 3 is a flow chart describing an exemplary implementation of the distributed management processes IVR combined with features of the present invention. 도 4는 본 발명의 특징들과 결합한 VXML 프로세스의 예시적인 수행을 설명하는 흐름도. Figure 4 is a flow chart describing an exemplary implementation of the VXML process combined with features of the present invention. 도 1은 본 발명에 따라 분산형 대화식 음성 처리 시스템(100)을 도시한다. Figure 1 illustrates a distributed interactive voice processing system 100 in accordance with the present invention. 도 1에 도시된 것처럼, 상기 분산형 대화식 음성 처리 시스템(100)은 로컬 영역 네트워크(LAN)(150)에 의해 상호접속된 160-N(이하, 일괄하여 에이전트 터미널들(160)로서 불림)을 통해 VoiceXML 애플리케이션 서버(110), 인터넷 프로토콜(IP) 구내 교환(private branch exchange:PBX)(120), 통화 관리 시스템(130) 및 하나 이상의 에이전트 터미널(160-1)을 포함한다. The like, the distributed interactive voice processing system 100 shown in Figure 1 is an interconnected 160-N (hereinafter, collectively referred to as agent terminals 160) by a local area network (LAN) (150) through VoiceXML application server 110, an Internet protocol (IP) telephone exchange: it includes (private branch exchange PBX) (120), call management system 130 and one or more agent terminals 160-1. 본 발명의 일 양태에 따라, 각각의 에이전트 터미널(160)은 "자동화 에이전트"의 기능들을 지원하기 위한 부가적인 IVR 능력들뿐만 아니라, IP 소프트폰(Softphone) 프로세스(170)와 같은, "라이브 에이전트(live agent)"의 종래의 기능들을 지원하기 위한 능력들을 포함한다. According to one aspect of the invention, each agent terminal 160 is "automated agents", as well as additional IVR capabilities for supporting functions of an IP softphone (Softphone) process, "live agent, such as 170 It includes the ability to support the function of the conventional (live agent) ". IP 소프트폰은 알려진 방법으로 종래의 전화를 에뮬레이팅한다. IP softphone is emulating a conventional phone in a known way. 주어진 라이브 에이전트의 에이전트 터미널(160)에 배치된 IVR 기능들은 주어진 라이브 에이전트들과 관계가 없다는 것이 주목된다. IVR functionality is disposed in the agent terminal (160) of a given live agents is noted that there is no relationship with the given live agent. 예시적인 실시예는 VoiceXML(VXML)을 사용하는 반면, 예를 들면, 음성 애플리케이션 언어 태그들(Speech Application Language Tags:SALT)로 설명된, 음성 애플리케이션 언어 태그들(SALT), www.saltforum.org로부터 다운로드 가능한, 기술 화이트 페이퍼(Technical White Paper)와 같은, IVR을 위한 HTML-기반 지원을 제공하는 다른 기술들은 당업자에게 명백한 것처럼, 여기에 개시한 것들에 기반하여 사용될 수 있다는 것이 주목된다. From the, audio application language tags described in: (SALT Speech Application Language Tags) (SALT), www.saltforum.org illustrative embodiments, while the use of VoiceXML (VXML), for example, the voice application language tags downloadable, technical white papers other technologies to provide support for HTML- based, IVR, such as (Technical white paper) will be noted that, as is apparent to those skilled in the art, can be based on those disclosed herein. SALT는 인터넷에 멀티-모드(multi-modal) 및 전화 접속(telephony access)을 가능하게 하기 위해 존재하는 마크업 언어들(markup languages)을 확장하는 음성 인터페이스 마크업 언어(speech interface markup language)이다. SALT is a multi the Internet - a speech interface markup language (speech interface markup language) to extend the mode (multi-modal) and dial the markup language present in order to enable (telephony access) (markup languages). (IVR 스크립트들을 포함하는) IVR 애플리케이션은, 예를 들면, VoiceXML에 기록되고 집중 VoiceXML 애플리케이션 서버(110)에 저장될 수 있다. IVR application (including IVR scripts) may be, for example, may be stored in and written in VoiceXML concentration VoiceXML application server 110. 집중 VoiceXML 애플리케이션 서버(110)는 상당한 관리 오버헤드(administrative overhead)없이 분산형 에이전트 터미널들(160)에 대해 버전 제어(version control) 및 애플리케이션 소프트웨어의 분배를 단순화하였다. Concentration VoiceXML application server 110 has been simplified to a considerable administrative overhead version control distribution (version control) and application software for a distributed agent terminals (160) without (administrative overhead). 도 4와 결합하여 아래에 더 논의된 것처럼, VoiceXML 애플리케이션 서버(110)는 자동 IVR 에이전트의 IVR 특징들을 지원하는 VXML 프로세스(400)로부터 예시적인 실시예에서 요청 VXML 페이지들을 표시한다. As will be discussed further in conjunction with Figure 4 below, VoiceXML application server 110 displays the requested VXML pages in the exemplary embodiment from a VXML process 400 that supports the IVR features of automatic IVR agent. VoiceXML 애플리케이션 서버(110)는 VXML 프로세스(400)를 가진 세션을 생성하고, 인터프리테이션(interpretation)을 위해 에이전트 터미널(160)에서 VXML 스크립트 안에 인코딩된 IVR 애플리케이션의 제 1 페이지를 VXML 프로세스(400)로 반환한다. VoiceXML application server 110 creates a session, and the interpretation of the first page of the IVR application encoded in VXML script on the agent terminal (160) VXML process 400 for (interpretation) with the VXML process 400 return to. 각각의 후속하는 요구를 위해, VoiceXML 애플리케이션 서버(110)는 렌더링(rendering)을 위해 요구하는 VoiceXML 프로세스(400)에 보내진 후속하는 문서(document)들을 얻거나 다이나믹하게 생성할 것이다(또는 둘 모두). For each subsequent request, VoiceXML application server 110 rendering (rendering) the will obtain or dynamically create a document (document) for subsequent sent to the VoiceXML process 400 that require (or both) in order. 통화자와 대화(interaction)가 끝날 때, VoiceXML 애플리케이션 서버(110)로부터 VXML 프로세스(400)에 보내진 최종 VXML 페이지는 적절한 통화 센터 에이전트 또는 애플리케이션에 통화를 종결하거나 전송할 것을 VXML 프로세스(400)에게 지시할 것이다. When the caller and the conversation (interaction) end, from the VoiceXML application server 110 final VXML page sent to the VXML process 400 may be instructed to terminate or transfer the call to the appropriate call center agents or applications to VXML process 400 will be. VoiceXML 애플리케이션 서버(110)는, 예를 들면, 본 발명의 특징들 및 기능들을 이행하기 위해 여기에 조절된 것처럼, Microsoft Corp. VoiceXML application server 110, for example, as a control here to implement the features and functions of the present invention, Microsoft Corp. of Redmond, WA로부터 상업적으로 이용가능한, 인스톨되고 가능한 인터넷 정보 서비스(Internet Information Services:IIS) 패키지를 가진 마이크로소프트 웹 서버(Microsoft Web Server)로써, 구현될 수 있다. of Redmond, and commercial installation possible, using the available Internet Information Services from WA: as (Internet Information Services IIS) Microsoft's Web server (Microsoft Web Server) with the package, it can be implemented. IP PBX(120)은, 도 3과 관련하여 아래에 논의된, 본 발명에 따라 분산형 IVR 리소스들을 관리하는, 자동 통화 분산 프로세스(automatic call distribution process)(300)를 포함한다. The IP PBX (120) is associated with automatic call distribution process (automatic call distribution process) (300), for managing a distributed IVR resources according to the present invention, discussed below with respect to FIG. 일반적으로, 자동 통화 분산 프로세스(300)는, 도 2와 관련되어 논의된, 에이전트 데이터베이스(200)를 사용하는 분산형 대화식 음성 처리 시스템(100)에서 모든 라이브 및 자동 IVR 에이전트들의 이용가능 상태를 모니터링하고, 적절한 에이전트들에 대해 전화 통화들과 다른 형태의 통신들을 공급한다. In general, the automatic call distribution process 300, also associated with a second monitor the discussion, the use of all the live and automated IVR agent in a distributed interactive voice processing system 100 using the agent database 200 Condition and it supplies the other forms of communication with the phone call to the appropriate agent. IP PBX(120)는 적절한 보고들과 예측들의 산출을 위해, 개인 에이전트들과 다른 통화 센터 통계의 이용가능성에 따라서 통화 관리 시스템(130)에 대한 정보를 공급할 수 있다. IP PBX (120) can provide information on the call management system 130 according to the availability of suitable for the calculation of the report and the prediction, individual agents and other call center statistics. 통화 관리 시스템(130)은 예를 들어, Call Management System ® 로서, 본 발명의 특징들 및 기능들을 이행하기 위해 여기에 변형된 바와 같이, 뉴저지, 베이킹 리지의 AVAYA Inc.로부터 상업적으로 이용가능하게 구현할 수 있다. Call management system 130, for example, a Call Management System ®, as to implement the features and functions of the present invention modified herein, New Jersey, implemented as commercially available from AVAYA Inc. of baking ridge can. IP PBX(120)는 예를 들어, IP(600) 인터넷 프로토콜 통신 서버로서, 본 발명의 특징들 및 기능들을 이행하기 위해 여기에 변형된 바와 같이, 뉴저지, 베이킹 리지의 AVAYA Inc.로부터 상업적으로 이용가능하게 구현할 수 있다. IP PBX (120), for example, IP (600) as Internet Protocol communications server, commercially available from As to implement the features and functions of the present invention modified herein, New Jersey, AVAYA Inc. of baking ridge It may possibly be implemented. 주어진 에이전트 터미널(160)의 IVR 능력들은 대응하는 에이전트 터미널(160)에서 데스크탑 전화의 경우 로그온된 에이전트로서 자동 통화 분산 프로세스(300)에 나타난다. IVR capabilities of a given agent terminal 160 are displayed on the automatic call distribution process 300 as an agent log on for the desktop phone in the agent terminal 160 for responses. 통화가 분산형 대화식 음성 처리 시스템(100)에서 수신될 때, 상기 통화는 에이전트 터미널(160)상에 IVR 확장에 대해 잘 알려진 기술들을 사용하여 발송되고 원격 IVR 프로세스는 통화를 조종한다. When the call is received by the distributed interactive voice processing system 100, the communication is sent by using the well-known technique for the IVR extension on the agent terminal 160, remote IVR process controls the call. 상기 에이전트 터미널들(160)은 퍼스널 컴퓨터, 워크스테이션 또는 개인 휴대 정보 단말(personal digital assistant)과 같이, 본 발명의 개시된 특징들과 기능들을 수행하기 위해 구성된 프로세서와 메모리를 가진 어떠한 컴퓨팅 시스템(computing system)으로도 구현될 수 있다. The agent terminals 160 is a personal computer, a workstation or a personal portable information terminal (personal digital assistant) and the like, any computing systems (computing system having a processor and memory configured to perform the features and functions described in the invention ) as it may also be implemented. 도 1에서 도시되고, 이후에 더 논의된 것처럼, 에이전트 터미널(160)은, 도 4와 관련하여 이후에 논의된, VXML 프로세스(400), 자동 IVR 에이전트의 IVR 능력들을 지원하는 텍스트-음성 변환 리소스들(180)과 자동 음성 인식의 설정을 포함한다. As also is shown in Figure 1, discussed further later, the agent terminal 160, also in relation to the four discussed later, VXML process 400, text supporting IVR capabilities of the automated IVR agent-to-speech resources It includes a set of the 180 and the automatic speech recognition. 일반적으로, 통화가 주어진 에이전트 터미널(160)의 분배된 IVR 확장에 대해 할당될 때, 할당된 VXML 프로세스(400)는 VoiceXML 애플리케이션 서버(110)로부터 적합한 애플리케이션 페이지를 얻고, IVR 스크립트로부터 통화자에게 적합한 프롬프트들을 수행하고 통화자로부터 DTMF 또는 음성 인식된 입력들을 수집하기 위해 VXML 페이지를 실행하기 시작한다. In general, when the call is assigned to the distributed IVR expansion of a given agent terminal 160, the assigned VXML process 400 obtains the application page suitable from the VoiceXML application server 110, from the IVR scripts suitable to the speaker performs prompt and started to run VXML page to collect DTMF or speech recognition input from the caller. 주어진 통화가 끝날 때, 상기 VXML 프로세스(400)는 통화를 끝내거나 적합한 통화 센터 에이전트 또는 애플리케이션에 대해 통화를 전송하기 위해 IP PBX 스위치(120)를 요구할 것이다. When a given call has ended, the VXML process 400 will ask the IP PBX switch 120 to transfer the call to the end the call, or the appropriate call center agent or application. 앞서 설명된 것처럼, 자동 통화 분산 프로세스(300)는 도 2에 도시된, 분산형 대화식 음성 처리 시스템(100)에서 모든 라이브 및 자동 IVR 에이전트들의 이용가능 상태를 기록하기 위해서, 에이전트 데이터베이스(200)를 이용한다. For recording, as described above, the automatic call distribution process 300 is available from the, all the live and automated IVR agent in a distributed interactive voice processing system 100 shown in Figure 2 state, when the agent database 200 use. 예시적인 에이전트 데이터베이스(200)는 각각의 서로 다른 라이브 및 자동화 에이전트와 관련된, 기록들(205 내지 220)와 같은, 복수의 기록들을 유지한다. An exemplary agent database 200 maintains a plurality of records, such as those, records relating to each of the different live and automated agent (205 to 220). 필드(230)에서 에이전트 식별자(agent identifier)에 의해 식별된 각각의 에이전트들에 대해, 에이전트 데이터베이스(200)는 필드(235)에서 에이전트의 확장 어드레스, 필드(240)에서 에이전트의 어떤 특정한 기술들의 표시(indication) 및 필드(250)에서 에이전트의 이용가능의 표시를 포함한다. In the field 230 for each of the agents identified by the agent ID (agent identifier), the agent database 200 includes an indication of any specific skills of the agent from the extended address, the field 240 of the agent in the field 235 It includes an indication of the availability of the agent in (indication) and fields (250). 필드들(230, 235, 240)에 기록된 정보는 일반적으로 통화 관리 시스템(130)에 의해 획득 및 유지되고, 필드(250)에 기록된 정보는 일반적으로 자동 통화 분산 프로세스(300)(위에 설명된 것처럼, 통화 관리 시스템(130)에 이용가능 상태를 차례로 제공할 수 있음)에 의해 획득 및 유지된다. The information recorded in the fields (230, 235, 240) are generally call is obtained and maintained by the management system 130, the information recorded in the field 250 is generally automatic call distribution process 300 (described above , it is obtained and held by the can provide state using the call management system 130, in turn), as. 도 3에 도시된, 자동 통화 분산 프로세스(300)는 분산형 대화식 음성 처리 시스템(100)에서 모든 라이브 및 자동 IVR 에이전트들의 이용가능 상태를 모니터링하고 적절한 에이전트들에 대해 전화 통화들과 다른 형태의 통신들을 분배함에 의해 분산 IVR 리소스들을 관리한다. The automatic call distribution process 300, shown in Figure 3 are distributed interactive voice processing system 100, all the live and automatically monitoring the use state of the IVR agent and other forms of communication with the phone call to the appropriate agent in the It manages distributed IVR resources by dispensing. 상기 자동 통화 분산 프로세스(300)는 종래의 집중 서버 시스템들로서 IVR 큐로 통화들을 배치한다. The automatic call distribution process 300 will place the IVR queue calls as conventional concentrated server system. 다음에 논의된 것처럼, 큐로 로그된 자동 IVR 에이전트(또는 라이브 에이전트)가 이용가능해질 때마다, 통화는 웨이팅 큐(waiting queue)로부터 선택되고 에이전트에 제시된다. As the following discussion, each time a queue of log automatic IVR agent (or a live agent) become available, the call is selected from the waiting queue (waiting queue) and presented to the agent. 시작된 각각의 통화와 완료된 각각의 통화의 기록은 통화 관리 시스템(130)에 상태와 히스토리기록들에 포함시킨다. Record of each call, each of the call is started and completed, is to include the status and the history recorded in the call management system 130. 도 3에 도시된 것처럼, 자동 통화 분산 프로세스(300)는 이벤트가 검출되었는지를 결정하기 위해 처음에 단계 300 동안 테스트를 수행한다. As shown in Figure 3, the automatic call distribution process 300 will perform a test during step 300 for the first time to determine if the event is detected. 만약 단계 310 동안 이벤트가 검출되지 않았다면, 프로그램 제어는 처리된 이벤트가 검출될 때까지 단계 310으로 되돌아간다. If the step has not been detected while the event 310, program control loops back to step 310 until the processed event is detected. 이벤트가 검출되는 것이 단계 310 동안 결정된 때, 이후의 테스트가 이벤트가 에이전트의 이용가능 상태에 변화가 있는지 결정하기 위해 단계 320 동안 수행되는 프로그램 제어는 단계 320를 시작한다. When it is determined during step 310 that the event is detected, program control test after the event is performed during step 320 to determine that a change in availability status of the agent begins a step 320. 만약 단계 320 동안 에이전트의 이용가능 상태에 변화가 없었다는 것이 결정되면, 프로그램 제어는 이후 논의될, 단계 360을 시작한다. If a step change is determined that there was the availability status of the agent for 320, program control is started, step 360 will be discussed later. 그러나, 만약 단계 320 동안 에이전트의 이용가능 상태에 변화가 있었다는 것이 결정되면, 이용가능 상태는 단계 330 동안 에이전트 데이터베이스(200)에 업데이트된다. However, if the step change is determined that there was the availability status of the agent for 320, available status is updated in step agent database 200 for 330. 이후의 테스트는 단계 340 동안 에이전트가 이용가능한지를 결정하기 위해 수행된다. Test after is performed to determine whether the agent is used during step 340. 단계 340 동안 에이전트가 이용가능하지 않다는 것이 결정되면, 프로그램 제어는 이용가능한 에이전트가 검출될 때까지 단계 340으로 되돌아간다. If it is determined during step 340 that is not available agent, the program control returns to step 340 until an available agent detection. 그러나, 만약 단계 340 동안 에이전트가 이용가능하다는 것이 결정되면, 통화는 IVR 큐로부터 선택되고 단계 350 동안 이용가능한 에이전트로 전송된다. However, if the step 340 the agent determines that it is available for a currency is selected from the IVR queue it is transmitted to the available agent used during step 350. 만약 단계 320 동안 에이전트의 이용가능 상태에 변화가 없다는 것이 측정되면, 이후 테스트는 이벤트가 착신 통화인지를 결정하기 위해 단계 360 동안 수행된다. If step 320 is not changed to measure the availability status of the agent for after the test is performed during step 360 to determine whether the event is an incoming call. 단계 360 동안 이벤트가 착신 통화가 아니라고 결정되면, 프로그램 제어는 단계 310으로 되돌아가고 상기 설명된 방식으로 계속된다. If during step 360, the event is determined not to be an incoming call, program control returns to step 310 it is continued in the manner described above. 만약 단계 360 동안 이벤트가 착신 통화라고 결정될 때, 모든 착신 통화들은 알려진 방식으로, 단계 370 동안 IVR 큐로 배치된다. If it during the step 360, the event is determined that an incoming call, all incoming calls are placed in a known manner, during step 370 IVR queue. 그리고 나서 프로그램 제어는 에이전트들의 이용가능 상태에서 변화들의 계속된 모니터링과 적합한 에이전트들에 대해 전화 통화들 및 다른 형태들의 통신들을 분배하기 위해 종료하거나 단계 310으로 되돌아간다. Then, the program control goes back to step 310 to shut down or to distribute the communication of the phone calls and other forms for the monitored with a suitable agent to continue use of the agent of the change in state. 앞서 설명한 것처럼, 에이전트 터미널들(160)은 자동 IVR 에이전트(들)의 IVR 능력들을 지원하는, 도 4에 도시된, VXML 프로세스(400)를 이용한다. As described earlier, use of the agent terminal 160 includes a, VXML process 400 shown in Figure 4, to support the IVR capabilities of the automated IVR agent (s). 일반적으로, 통화가 주어진 에이전트 터미널(160)의 분배된 IVR 확장에 할당될 때, 할당된 VXML 프로세스(400)는 VoiceXML 애플리케이션 서버(110)로부터 적절한 애플리케이션 페이지를 얻고 IVR 스크립트로부터 통화자까지 적합한 프롬프트들을 수행하기 위해 VXML 페이지를 실행하고 통화자로부터 DTMF 또는 음성 인식된 입력들을 수집하기를 시작한다. In general, when the call is assigned to the distributed IVR expansion of a given agent terminal 160, the assigned VXML process 400 obtains an appropriate application pages from the VoiceXML application server 110, the appropriate prompt to from the IVR script, the speaker run the VXML page to perform and start to collect DTMF or speech recognition input from the caller. 주어진 통화들이 끝날 때, VXML 프로세스(400)는 통화를 끊거나 적합한 콜 센터 에이전트 또는 애플리케이션에 통화를 이동하기 위해 IP PBX 스위치(120)를 요구할 것이다. When given to end calls, VXML process 400 will ask the IP PBX switch 120 to move the call to disconnect the call, or the appropriate call center agent or application. 도 4에 도시된 것처럼, 주어진 에이전트 터미널(160)의 IVR 능력들은 예를 들면, 라이브 에이전트가 에이전트 터미널(160)을 시작할 때, 단계(410) 동안 활성화될 수 있다. As shown in FIG. 4, IVR capabilities of a given agent terminal 160 are, for example, the live agent may be at the start of the agent terminal (160), activation during step 410. 그러므로, VXML 프로세스(400)는 IP 소프트 폰 프로세스(170), 및 임의의 ASR 및 TTS 프로세스들과 함께, 에이전트가 에이전트 터미널(160)을 시작할 때 시작될 것이다. Therefore, VXML process 400 with the IP softphone process 170, and any of the ASR and TTS process will be started when the agent will start the agent terminal (160). VXML 프로세스(400)는 처음에 "이용불능인" 모드(mode)에서 자동 IVR 에이전트로써 단계 420 동안 자동 통화 분산 프로세스(300)로 로그한다. VXML process 400 to log "unavailability of" mode (mode), automatic call distribution process 300 during step 420 by automated IVR agent in the first place. 상기 VXML 프로세스(400)는 'N' 초 동안 단계 430중에 에이전트 터미널의 CPU 이용을 모니터링한다. To the VXML process 400 is the step 430 for 'N' second monitors the CPU utilization of the agent terminal. 'N' 초 싸이클의 끝에서, VXML 프로세스(400)는 단계 440 동안 리소스들이 다음 'N' 초 동안 통화를 처리하기 위해 이용가능한지의 여부를 결정한다. At the end of the 'N' second cycle, the VXML process 400 to determine whether the use is possible for step 440 to the resource for processing the call within the next 'N' second. 예를 들면, CPU 싸이클들의 최소 수는 충분한 리소스들이 이용가능한지 결정하기 위한 문턱치(threshold)로써 지정될 수 있다. For example, the minimum number of CPU cycles may be designated as a threshold value (threshold) for determining whether sufficient resources are used. 다른 변형들에서, 충분한 소스들의 이용가능은 예를 들면, CPU 싸이클들의 변화율, 또는 사용자 마우스 또는 (부가적인 CPU 싸이클들이 그와 같은 사용자 입력에 따른 라이브 에이전트에 의해 소비될 것이라고 가정하는) 다른 사용자 입력 장치의 관측들에 기초할 수 있다. In another variation, the availability of sufficient source, for example, the change rate of the CPU cycle, or a user mouse or (assuming additional CPU cycles that will be consumed by the live agent, according to the user inputs, such as) other user input It may be based on observation of the device. 만약 단계 440 동안 리소스들이 이용가능하지 않을 것이라고 측정되면, VXML 프로세스(440)는 단계 450 동안 "이용불능" 모드에 머무르고, 단계 430으로 되돌아간다. If step 440 resources for that measurement would not be available, VXML process 440 stays at the "unavailable" mode during step 450, the process returns to step 430. 만약 단계 440 동안 리소스들이 이용가능할 것이라고 측정되면, VXML 프로세스(440)는 단계 450 동안 그것의 상태를 IP 소프트폰 프로세스(170)에 가상 에이전트 VXML 프로세스가 이용가능한 자동 통화 분산 프로세스(300)에게 신호를 요청함에 의해 "이용가능" 모드로 변경한다. If step 440 for resources that measure would be available, VXML process 440 signals its state during step 450 to IP softphone process automatic call distribution process 300 possible virtual agent VXML process using the (170) by the request and change to the "use" mode. 상기 VXML 프로세스(440)는 'N' 초 동안 단계 450에서 타이머를 시작하고, 통화를 기다린다. The VXML process 440 to start the timer in step 450 for 'N' seconds, and waits for the call. 만약 자동 통화 분산 프로세스(300)가 가상 에이전트가 IVR 큐로부터 통화를 수신하는 것이 측정되면, 상기 통화는 VXML 프로세스(440)의 확장(도 1에서 N 동안 확장 2와 같은)을 위해 정해진 목적지인, IP 소프트폰 소프트웨어(170)로 발송될 것이다. If the automatic call distribution process 300 is a virtual agent when it is determined to receive a call from the IVR queue, the call is given for expansion (Fig like extension 2 for N in 1) the VXML process 440, the destination, IP soft phone will be shipped with the software (170). VXML 프로세스(400)는 통화 가입자(calling party)의 전화 번호와 착신 통화로 통화하는 동안 통화된 번호를 수신하고, 예를 들면, HTTP 요청을 통해, VXML 애플리케이션 서버(110)에게 요청한다. VXML process 400 requests a call to the subscriber, VXML application server 110 receives the call number, for example, via an HTTP request for a call to the telephone number of the incoming call (calling party). 상기 VXML 애플리케이션 서버(110)는 인터프리테이션(interpretation)을 위한 단계 460 동안 수신된 VXML 스크립트에서 인코딩된 IVR 애플리케이션의 제 1 페이지를 에이전트 터미널(160) 상의 VXML 프로세스(400)로 반환한다. The VXML application server 110 returns the first page of the IVR application encoded in VXML script received during the step for interpretation (interpretation) 460 as VXML process 400 on the agent terminal (160). VXML 프로세스(400)는 페이지를 표시하기 위해서 단계 465 동안 로컬 CPU 리소스들을 이용하고, 만약 필요하다면, ASR 및 TTS 서비스들을 수행하고 결과들을 VXML 애플리케이션 서버(110)로 반환한다. VXML process 400 if using the local CPU resources during step 465 to display the page and, if necessary, perform ASR and TTS service and return the results to the VXML application server 110. 테스트는 통화자와의 대화(interaction)가 끝났는지를 결정하기 위해 단계 470 동안 수행된다. The test is performed during step 470 to determine if the conversation (interaction) with the caller kkeutnatneun. 예를 들면, VXML 애플리케이션 서버(110)로부터 VXML 프로세스(400 )에 보내진 마지막 VXML 페이지는 VXML 프로세스(400)에게 통화를 끝내거나 전송할 것을 지시할 수 있다. For example, the final VXML page sent to the VXML process 400 from the VXML application server 110 may indicate that, end, or send the call to a VXML process 400. 만약 단계 470 동안 통화자와의 대화가 끝나지 않았다면, 상기 VXML 프로세스(400)는 다음 IVR 스크립트 페이지를 처리하기 위해 단계 465로 되돌아갈 것이다. If the steps did not end the conversation with the caller over 470, and the VXML process 400 will return to step 465 to process the next IVR script page. 만약 단계 470 동안 통화자와의 대화가 끝났다면, 상기 VXML 프로세스(400)는 단계 480 동안 IP 소프트폰 프로세스(170)에게 통화를 끊거나 전송할 것을 요청할 것이다. If the step is dialogue with the caller side for over 470, and the VXML process 400 will request that disconnects the call to the IP softphone process 170 or send over 480 steps. 자동 통화 분산 프로세스(300)와 가상 에이전트 사이의 표준 프로세스의 부분으로서, 상기 가상 에이전트는 자동적으로 "이용불능" 모드로 될 것이다. As part of the standard process between the automatic call distribution process 300 and the virtual agent, the virtual agent will be in the "unavailable" mode automatically. 그리고 나서 VXML 프로세스(400)는 시스템 리소스들을 모니터링하기 위해 단계 430으로 되돌아갈 것이다. Then VXML process 400 will return to step 430 to monitor system resources. 만약 단계 440 동안 에이전트 터미널(160)의 예측된 이용가능성이 부정확한 것이 밝혀진다면, 상기 터미널(160)은 알려진 방식대로, 단지 라이브 에이전트의 기능들과 자동화 에이전트의 IVR 기능들 사이의 이용가능 CPU 싸이클들을 시분할해야한다. If step if the estimated availability of agents terminal 160 turns out to inaccurate for a 440, the terminal 160 is available between the IVR function of the function and automated agents in in known manner, only the live agent CPU cycles should the timeshare. 여기에 도시되고 설명된 실시예들 및 변형들은 단순히 본 발명의 원리들의 예시가 되는 것이고, 본 발명의 범위 및 의도를 벗어남이 없이 당업자에 의해 다양한 변형들이 수행될 수 있다. Here the embodiment shown and described embodiments and modifications are merely would be an example of the principles of the present invention, various modifications can be carried out by those skilled in the art without departing from the scope and spirit of the invention. 상기 에이전트 터미널들 중 하나 이상에서 이용가능 CPU 싸이클들(cycles)의 수를 예측하고, 상기 예측된 이용가능 CPU 싸이클들의 수에 기초하여 상기 에이전트 터미널들에 호들을 분배하기 위한 통화 관리 시스템(call management system)을 포함하는, 시스템. Call Management System estimate the number of the agent on at least one of the terminals available CPU cycles of (cycles), and based on a number of the predicted available CPU cycles to distribute the call to the agent terminal (call management the system includes a system). 상기 에이전트 터미널 중 적어도 하나는 적어도 하나의 대화식 음성 응답 기능을 수행하기 위해 로컬 처리 리소스들을 이용하는, 시스템. At least one of the agent terminals, the at least one interactive, system using the local processing resources to perform the audio response function. 상기 적어도 하나의 대화식 음성 응답 기능은 IVR 스크립트를 렌더링(rendering)하는 것을 포함하는, 시스템. The at least one interactive voice response functions are, the system comprising an IVR script rendering (rendering). 상기 적어도 하나의 대화식 음성 응답 기능은 자동 음성 인식 기능(automatic speech recognition function)을 포함하는, 시스템. The at least one interactive voice response function is automatic speech recognition (automatic speech recognition function), the system comprising a. 상기 적어도 하나의 대화식 음성 응답 기능은 텍스트-음성 변환(text-to-speech translation) 기능을 포함하는, 시스템. The at least one interactive voice response function is a text-to-speech (text-to-speech translation), the system including a function. 상기 에이전트 터미널들 중 적어도 하나는 상기 휴먼 에이전트에 대해 IP 전화 리소스들(IP telephony resources)을 제공하기 위한 로컬 처리 리소스들을 사용하는, 시스템. The agent terminal and at least one of, the system using the local processing resources for providing the IP telephone resources (IP telephony resources) for the human agent. 상기 예측된 이용가능 CPU 싸이클들의 수에 기초하여 상기 에이전트 터미널들에 호들을 분배하도록 구성되는, 시스템. The system based on the number of the predicted available CPU cycles are configured to distribute the call to the agent terminal. 상기 대화식 음성 응답 능력들은 IVR 스크립트를 렌더링하는 것을 포함하는, 시스템. The interactive voice response capabilities are, the system comprising rendering the IVR script. 상기 대화식 음성 응답 능력들은 자동 음성 인식 기능을 포함하는, 시스템. The interactive voice response capabilities are, the system includes an automatic speech recognition. 상기 대화식 음성 응답 능력들은 텍스트-음성 변환 기능을 포함하는, 시스템. The interactive voice response capabilities are text - the system that includes speech functionality. 상기 예측된 이용가능 CPU 싸이클들의 수에 기초하여 휴먼 에이전트에게 전용되는 컴퓨팅 시스템 상에서 실행하는 대화식 음성 응답 채널을 사용하여 상기 호를 처리하는 단계를 포함하는, 방법. Method using an interactive voice response channel running on a computing system based on the number of the predicted available CPU cycles dedicated to the human agent includes the step of processing the call. 휴먼 에이전트에 전용되는 상기 컴퓨팅 시스템은 적어도 하나의 대화식 음성 응답 기능을 수행하기 위해 로컬 처리 리소스들을 사용하는, 방법. The computing system dedicated to the human agent, using the local processing resources to perform at least one interactive voice response functions. 상기 예측된 CPU 싸이클들의 수에 기초하여 이용가능 자동화 에이전트에 대해 상기 호를 할당하는 단계를 포함하는, 통화 센터에서 자동화 에이전트에 호를 할당하기 위한 방법. A method for assigning a call to an automated agent at the basis of the number of the predicted CPU cycles available for the automated agent includes assigning the call, a call center. 상기 자동화 에이전트들이 실행하는 상기 적어도 하나의 컴퓨터 시스템은 적어도 하나의 대화식 음성 응답 기능을 수행하기 위해 로컬 처리 리소스들을 사용하는, 통화 센터에서 자동화 에이전트에 호를 할당하기 위한 방법. A method for assigning a call to the at least one computer system, an automated agent in, call center using the local processing resources to perform at least one interactive voice response capability to the automated agent may be implemented.